How did titanium-bearing (heavy mineral) sands accumulate in Trail Ridge? About 1.8 million years ago, a period of time that marks the boundary between the Pliocene and the Pleistocene, there existed an enormous barrier island off the coast of south Georgia and north Florida that was 130 miles long. A high stand of the Atlantic Ocean combined with wind and wave to create this island which encroached upon and buried a freshwater marsh, then an extension of an early version of the Okefenokee Swamp. Today, this island is a terrace standing above the surrounding lowlands. Placer deposits of titanium-bearing heavy mineral sands motivated Dupont Corporation to buy large portions of Trail Ridge from lumber companies, but as I noted in my previous blog entry, the controversy over the potential environmental damage was so great that the project was canceled. Mining heavy mineral sands is a strip mining operation where all vegetation and topsoil is stripped from the ground. Then big machines eat through vast areas of subsoil, the material churned through pumped-up ground water for 7 days a week and 24 hours a day–an unceasing, hellish operation. The surrounding area suffers constant heavy truck traffic as well because the separated minerals must be transported to distant factories. After the land is raped, reclamation efforts turn the mined areas into tree farms and ponds–the former a paltry substitute for the original forest. Image of a titanium mine in Florida. The water is necessary in a step that separates the minerals from the sand. The reclaimed land becomes wetlands and tree farms. Wetlands are resilient but monocultured tree farms are almost barren of wildlife. It’s no wonder Dupont Corporation was pressured not to destroy Trail Ridge, but they have other environmentally detrimental projects around the world including some in nearby Florida. Dupont mines four kinds of coumpounds from heavy mineral soils like those that exist in Trail Ridge. Ilmenite, or titanium dioxide (FeTiO3), is used as an industrial white pigment; rutile, or titanium oxide (TiO2), is used as a metal alloy; zircon (ZnSO4) is used as a refractory for founding molds and nuclear fuel rods; and monazite ( (Ce, La, Th)PO4) is a radioactive compound consisting of rare earth elements used in high powered magnets, industrial pigment, x-ray screens, fiber optics, and color television tubes. These heavy mineral sands are black and are usually located under several feet of regular sand, though they occasionally appear on the surface, if erosion occurs. They are radioactive. Dr. Gale Bishop of Georgia Southern University found that sea turtles occasionally nest in these radioactive sands (which also occur on St. Catherine’s Island), and the baby turtles suffered a high rate of mutation and mortality. A complex geological process led to the accumulation of heavy mineral sands in Trail Ridge and other areas along the coast, such as St. Catherine’s Island. Metamorphic rocks, those formed deep underground, are the most important source of titanium, but igneous rocks from Mesozoic-aged volcanic flood basalts, and even sedimentary rocks are contributing sources of titanium. Rocks located from what’s now South Carolina to Canada are the original sources of titanium-bearing minerals. Rain water weathered these rocks into a substance known as saprolite which later eroded into rivers. Rivers carried these titanium-bearing sands into the ocean. As the ocean transgressed, these sediments were reworked to the surface where long shore currents and winds concentrated the heavy mineral sands into specific placer deposits. They concentrated together because they have a certain relative density (specific gravity) that differs from just plain sand, and they tend to deposit in the same places. Rain further concentrated the minerals by leaching out iron oxides. Dupont Corporation’s plan to mine titanium from heavy mineral sands in Trail Ridge, which borders the eastern boundary of the Okefenokee Swamp, sparked a crash course study of the geology and ecology of the Okefenokee Swamp. Scientists and environmentalists feared the impact of the mine could have seriously degraded the swamp. The potential environmental degradation was so feared, that even conservative politicians opposed the project, and ten years ago Dupont agreed to abandon the proposal and sell the land to the state and the Nature Conservancy. 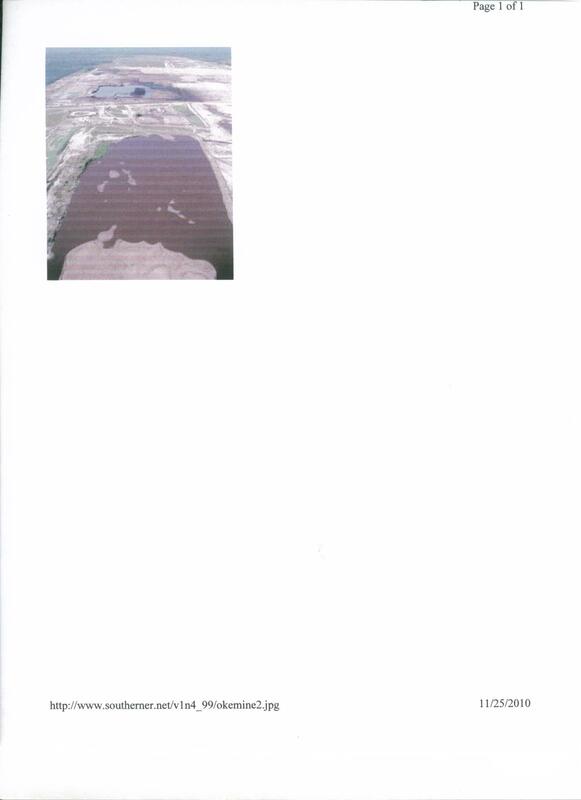 But the resulting research papers provided a wonderful source of knowledge and excellent fodder for my blog. The existence of the Okefenokee basin is due to many different geological factors. It’s located in a region known as the southeast Georgia embayment. This area was submerged under the Atlantic Ocean during the Cretaceous and for most of the Eocene. During the Eocene, sediment intermittently began to be deposited, but late in the Eocene, strong ocean currents are believed to have washed these away. U.S. Geological Survey bore holes near the Okefenokee Swamp reach late Miocene strata about 65-70 feet below the surface. This strata consists of limestone pitted with the impressions of fossil sea shells–evidence that as recently as 5 million years ago, the southeast Georgia embayment was still periodically inundated with sea water. Above this limestone layer is an impermeable clay of Pliocene age. Here we find two reasons for the Okefenokee basin’s existence: the basin sagged because rainwater caused the limestone bedrock to dissolve (albeit unevenly) in a process known as karstification, and the clay layer above this prevents water from draining, thus providing the optimum conditions for wetlands to develop within the basin. Hardwood hammocks, the islands within the swamp, are elevated above the basin. These were formed during the late Miocene/early Pliocene when the area was still under sea water. Ocean currents and river sedimentation built these little islands. Later, when the basin emerged above sea level, the islands remained in place as dry land humps in the swamp. 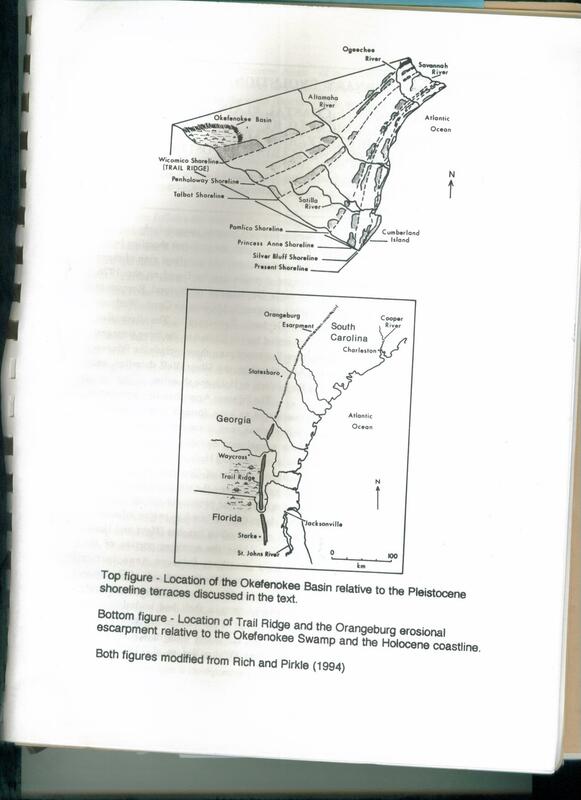 The southeast Georgia embayment emerged above sea level during the Pliocene, and the resulting geological uplift caused the Suwanee River to backflow and reverse course, providing the source of all the fresh water accumulated there. 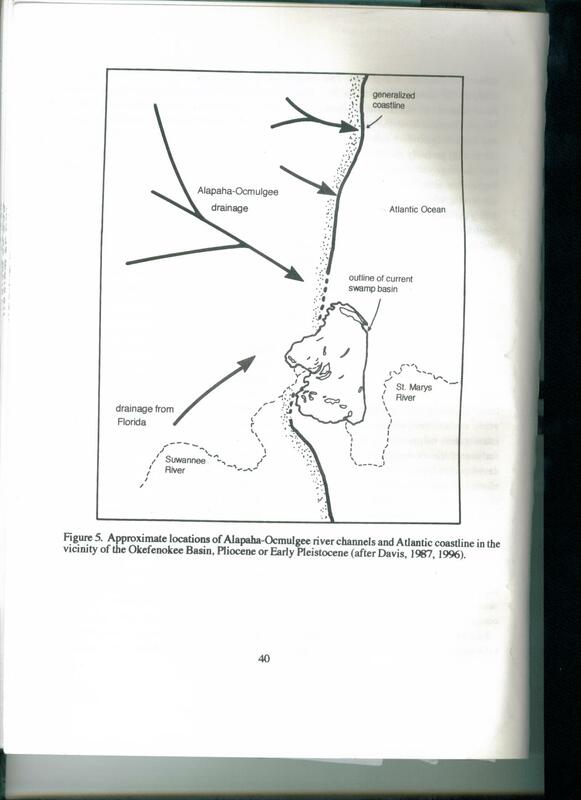 Map of Georgia’s Pliocene shoreline. The present day location of the Okefenokee Swamp was submerged under the Atlantic Ocean. The Suwannee River flowed from west to east. After the emergence of the Okefenokee Swamp basin above sea level, geological uplift caused the Suwanee River to back flow into the basin and reversed its course, so that it flows west instead of east. Note the islands which later became hardwood hammocks. Illustration from ‘The Geological and Natural History of the Okefenokee Swamp and Trail Ridge’ by Rich and Bishop. Some scientists hypothesized that the early Okefenokee Swamp basin was a massive estuary and salt marsh, but there’s no evidence of this. Instead, evidence from the nearby Trail Ridge to the east of the swamp suggests the basin has been a freshwater swamp since early in its existence. Trail Ridge was originally a massive barrier island 130 miles long which is far longer than any current barrier island off the Atlantic Coast, the longest in Georgia being Cumberland Island which is a mere 16 miles long. Cape Hatteras off the North Carolina Coast is only 48 miles long. Trail Ridge runs from south Georgia to North Florida as the following map will show. This geological feature too contributes to the back flow of water into the swamp but is considered a minor influence compared to geological uplift, limestone sinkage, and the impermeable clay layer. Scientists have discovered fossil freshwater swamp vegetation buried under Trail Ridge sands–evidence that a swamp already existed in the area late in the Pliocene when the barrier island that is now Trail Ridge first formed during a high stand of the Atlantic Ocean. Trail Ridge is the oldest terrace on Georgia’s coastal plain. Terraces run parallel to the Atlantic Ocean and were all formerly barrier islands that formed during warm interglacials or interstadials when sea level was higher than that of today’s. Logically, the oldest terraces are further west because subsequent high stands of water would have washed younger ones away. Map of Pleistocene terraces on the Georgia coastal plain. Terraces were barrier islands formed during warm climate cycles when sea level was higher than that of today. From west to east they are aged from oldest to youngest. Scientists name these terraces. The following is a list of the terraces and their estimated ages. (Note: scientists don’t always agree with these age estimates. I’m using those from a college thesis that I list in my references.) The Wicomicico Shoreline (Trail Ridge)–1.8 million years; the Penholoway Shoreline–780,000 years; the Talbot shoreline–240,000 years; the Pamlico shoreline–130,000 years; the Princess Anne shoreline–80,000 years; and the Silver Bluff shoreline–40,000 years. The Talbot shoreline formed during the Yarmouthian interglacial. The Pamlico shoreline formed during the Sangamonian Interglacial. The Princess Anne shoreline formed during the early Wisconsin Ice Age when sea level was dropping but paused during an interstadial. The Silver Bluff shoreline also formed during a pause in sea level drop caused by an interstadial. Eventually, during glacial cycles, the shoreline could be located as much as 50 miles to the east of where it is today due to a lowering of sea level when much of the planet’s water was locked in ice. Pollen and fossil wood has been recovered from Grays Reef, 11 miles off Sapelo Island, showing that forest and prairie grew in areas deep under water today. It’s interesting to note that the Silver Bluff and Princess Anne shorelines formed when ice core data suggest temperatures were cooler than those of today. I think this shows that a certain threshold must be met before sea level fell drastically during glacial cycles. The sea level had been falling during the Wisconsin Ice Age but paused when the climate warmed up, even though it wasn’t as warm as that of today. It also shows that sea level lags behind climate change by thousands of years. The Okefenokee Swamp apparently has existed since the late Pliocene, but it has been an intermittent existence. During the Pleistocene whenever there was a cycle of glacial expansion, the climate became cool and arid. Sea level retreated many miles to the east and the water table fell, causing the Okefenokee Swamp to become a relatively dry basin. Instead of hosting primarily wetland vegetation, oaks and pines and grasses grew in the basin. Wetland species such as cypress, tupelo, and water lily, still existed but were relegated to small scale marshes bordering the rivers and streams that still incised the basin. Some time during a glacial cycle, wind and remaining water eroded 4 elliptically shaped Carolina Bays into the swamp basin. 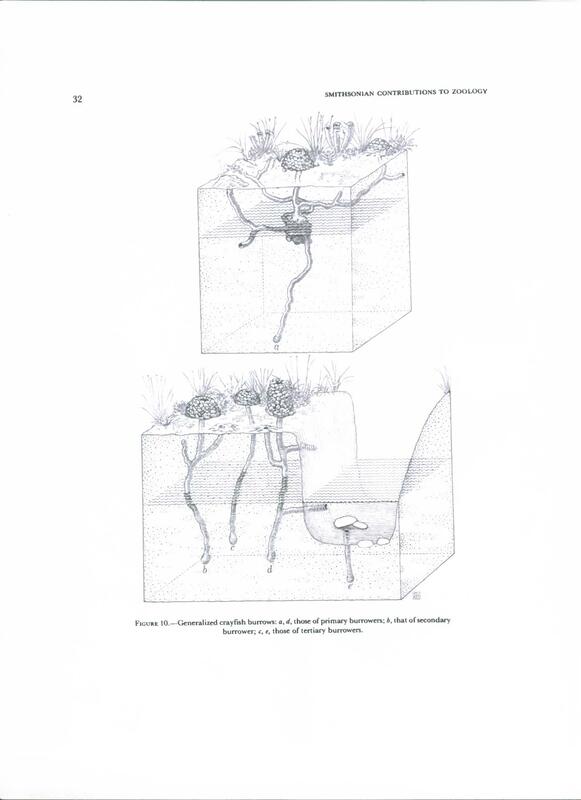 The bays, along with the remaining rivers, provided relic habitat that allowed wetland plants to rapidly recolonize the basin when climatic conditions once again became favorable to swamp development. Scientist have taken cores of the peat in the swamp and discovered that the peat in today’s Okefenokee has only been accumulating for 6600 years. It’s likely the Okefenokee basin was dryland habitat from about 36,000 years BP to about 7,000 years BP. The last glacial maximum, the coldest and dryest climate cycle of the late Pleistocene, lasted from 28,000 BP-15,000 BP. So it took thousands of years for the water table to rise to swamp level again, following the drying out of the swamp during the Ice Age. Geology and Natural History of the Okefenokee Swamp and Trail Ridge, southeastern Georgia and northern Florida. Tens of millions of years ago, probably when dinosaurs still stalked the earth, armies of salt water crustaceans inhabited the shallow seas, salt marshes, and estuaries so abundant in that watery age. During the Eocene when the Atlantic Ocean periodically receded from the North American continent, these marine crustaceans began to evolve the ability to survive in brackish water habitats that became more and more common, and eventually they evolved into freshwater organisms. The ecological niche they colonized had few, if any, competitors, and many species evolved. Southeastern North America has the most species on the continent–evidence that this is the region where crayfish first colonized fresh water. 68 species of 8 genera are known to occur in Georgia today. Illustration of crayfish anatomy from Crayfishes of Georgia by Holcombe Hobbs. Biologists like to study crayfish because they represent good case studies of evolution. Barriers often form in river drainages, isolating different populations of crayfish, and accordingly this affords frequent opportunity for speciation to occur. Scientists use cladistics (the comparison of anatomical characteristics) to determine the evolutionary relationships between species. Of course, DNA testing is an even more accurate way to determine these relationships. 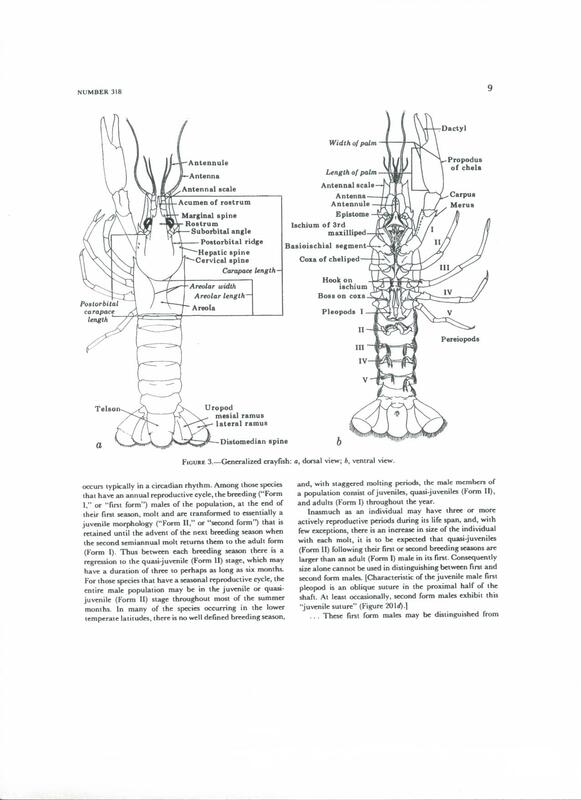 Holcombe Hobbs was the foremost crayfish expert in Georgia, and he wrote a very thorough book in 1981–The Crayfishes of Georgia which is available online http://si-pddr.si.edu/dspace/handle/10088/5545 for free. He knew of 65 species in state. In the 30 years since his book was published, only 3 additional species have been discovered in Georgia surveys, showing just how thorough he was. I find most interesting the burrowing habits of crayfish which create little mud chimneys in wet fields and stream sides. Crayfish also burrow at the bottom of streams, but these don’t result in visible chimneys. Illustration of crayfish burrows from The Crayfishes of Georgia. Note the chimney-like hills. It’s likely the ancestors of crayfish lived in intertidal zones near the sea shore. At low tide they survived dessication by digging burrows in the sand and mud, similar to many modern day organisms. Later, this habit helped them survive drought when they colonized upland freshwater habitats. Crayfish are yet another example of a Pleistocene survivor because they were able to survive the many dry climate phases of the Ice Ages. Today, upland crayfish dig burrows down to the water table. Other species dig burrows directly in stream beds. The ones that dig on land usually tunnel around tree roots. According to Dr. Hobbs, these can be difficult to excavate when collecting specimens. Some species defend their burrows aggressively; others retreat deeper into side chambers. During droughts and cold weather, crayfish plug the tops of their chimneys to stay warm and moist. If the water table falls below the level of their burrow, they become dormant. Much crayfish habitat has been destroyed by the creation of reservoirs which are like deserts for this animal. They don’t like deep water. However, man has created a lot of crayfish habitat. Crayfish do like to live in roadside ditches. Here’s a list of major rivers and drainage systems in Georgia and the number of known crayfish species each holds. When my family first moved to Athens, Georgia in 1976 (I was 13), I delighted in rambling around the woods that surrounded the partially developed residential neighborhood, not far from Cedar Shoals High School. It was mostly second growth pine and oak interspersed with old fields and plum thickets. There was even a pond site with a small waterfall that led to a chain of beaver ponds. (Developers have since destroyed this last described landscape and built a shopping center over it.) One day, a newfound friend and I took a dip net to one of the creeks we frequently followed. Along the creeks, we always saw the handlike prints of raccoons, and occasionally the empty shell of a crayfish that had provided a meal for the former. Simply by swinging the net across the bottom of a stony section of the creek, we collected two dozen crayfish in a short period of time. We put the crustaceans in a bucket and brought them h0me, setting the container in a backyard lawn. The next morning, the crayfish had vanished–a mystery for us then because we didn’t know crayfish are nocturnal and can travel over land at night. Crayfish taste delicious–much like shrimp but without the iodine flavor. Eat them fresh, not previously frozen. Fresh, the tail meat is delectable, and the juice from the heads (actually the brain) is rich. Previously frozen, they smell bad upon preparation. The tail meat is still palatable, though nothing special, but the juice from the heads tastes like a mixture of mud and rotten fish. How Widespread were Open Pine Savannahs During the Pleistocene? 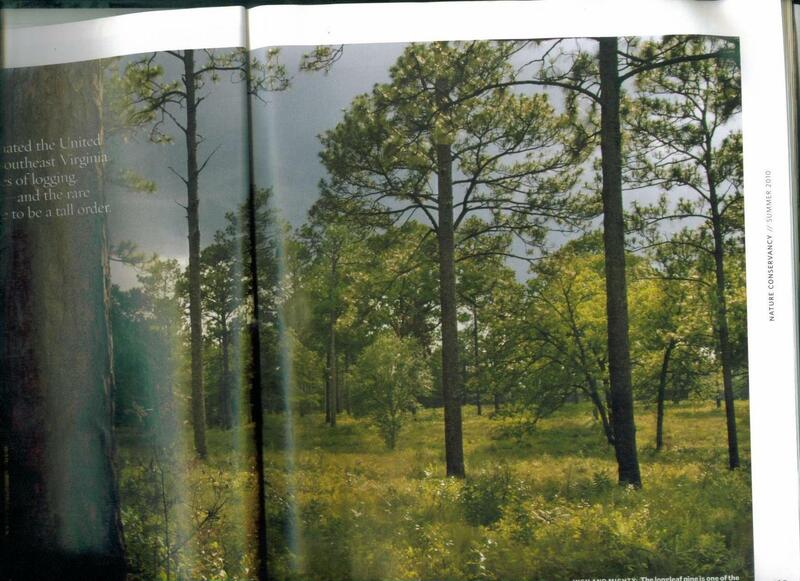 Photo of an open pine savannah from the Summer 2010 issue of the Nature Conservancy Magazine. The photo was taken by Beth Young. Modern day ecologists are attempting to protect and restore the last remnants of open pine savannahs in the southeast. Open pine savannahs were the most common type of ecosystem in the coastal plain of southeastern North America when Europeans first colonized the continent. They are rich unique landscapes dependent upon frequent light fires that incinerate brush and saplings, creating an environment where pine trees grow far enough apart for grassy glades to exist between the widely spaced conifers. Typically, pine needles slough off the trees, falling on top of tufts of wiregrass. Droughts dry this combustible material which later is ignited by lightning or humans. The fires kill hardwood saplings, but longleaf pines have fire resistant bark, and the grass roots survive underground, thus explaining how the environment becomes dominated by pine and grass. Scientists consider the sloughing off of combustible pine needles as an active evolutionary adaptation by longleaf pines to maintain the type of environment they need to survive–it prevents them from being shaded out in the closed canopy forests that would grow without fire. Another name for this ecotype is the pine barrens, but this is misleading. On first glance these savannahs may seem monotonous, but they’re quite diverse–over 100 species of plants have been surveyed in as little as 1/4 acre. This is a higher diversity than any other ecosystem in North America. Wiregrass is the most common grass. It co-occurs with many species of grass in the Poaceae family, as well as species of legumes (Faboceae), and flowering asters (Asteraceae). Low bush blueberries love to sprout and colonize fire-prone savannahs, and they abound here. Bird diversity is high too, and one species occuring only here includes the endangered red cockaded woodpecker. There are different kinds of pine savannahs as well–the types of plants and animals living on them vary according to how well drained the soil is. On the driest sandy sites, where there isn’t enough tinder for even light fires, scrubby oaks predominate. On well drained sites with good soils tall longleaf pines and wiregrass dominate the vegetation, and gopher tortoises and gophers can be found digging their burrows. On poorly drained sites wet pine savannahs are home to sphagnum moss and chimney hill crayfish. And there are areas grading between wet and dry savannah. Rivers, streams, and Carolina Bays are watery barriers that protect some sites from fire, allowing cypress swamps and hardwood forests to grow. In the 19th century man began the destruction of this ecosystem. Workers harvested resin to manufacture naval stores (turpentine and tar). This killed many trees and degraded the environment. Later, lumbermen and farmers cleared the land and planted horizon-to-horizon field crops such as cotton and peanuts. Fires were suppressed to protect lumber, and loblolly pine replaced longleaf pine as the dominant tree in now closed canopy forests. So today’s coastal plain landscape bares no resemblance whatsoever to the original. Thankfully, at least a few pitiful remnants still exist on military bases, and on lands belonging to hunting clubs specializing in quail which thrive in this type of enviroment. Organizations such as the Nature Conservancy are working to protect these areas. I don’t think scientists currently studying open pine savannahs are aware that Frances Harper extensively surveyed this ecosystem on the uplands surrounding the Okefenokee while researching his 1927 book, Mammals of the Okefenokee Swamp. They never reference it. Though many areas of the savannah were already damaged from naval store activity, he was able to study them before their final destruction at the hands of clear cutters and agriculturalists. Here’s his list of plant and animal abundance by species, listed from most abundant to least. fox squirrel–less common today because they like open forests. Frances Harper was 12,000 years too late to record the animals that would’ve thrived on open pine savannahs during the Pleistocene. Here’s my additions. The order of abundance is, of course, unknown. Peccaries–two kinds. The flat-headed peccary is thought to have preferred scrubby forests that would’ve been common during dry glacial climate phases. I believe open pine savannahs are a very old ecosystem descended from the first grasslands that evolved during the Oligocene or Miocene. It’s true that Indian-set fires facilitated the extent of these grasslands, but savannahs must have existed prior to the advent of man here. Ironically, pine savannahs were probably more widespread during wetter climate phases because lightning from more frequent thunderstorms would’ve ignited more fires. During cold arid glacial stages, scrubby oak thickets expanded at the expense of pine savannahs due to lessened incidence of lightning-induced fires in an environment so dry that eolian sand dunes rolled across the landscape. The Pleistocene climate fluctuated between wet and dry climate phases, depending on whether the Laurentide glacier to the north was in a melting or expanding phase. The ratio of pine savannah to oak scrub habitat corresponded to these climate phases–the pine savannah expanding with melt water wet phases; the oak scrub/desert expanding with dry cool expansion phases. But neither habitat was completely eliminated during the climate fluctuations unfavorbable to them. Many pollen studies show these alternating dry and wet climate phases still occur, though they’re not as drastic as the Ice Age fluctuations. Today, we’re in a wetter phase, but 5,000 years ago the climate was much drier. The bigggest influence on open pine savannahs during the Pleistocene, besides climate, was the megafauna. Cooler climate and megafauna grazing, trampling, and dung-depositing probably caused the savannahs to vary more in composition than they do today, but their basic structure was likely similar, and they were just as widespread as they were when white men invaded the continent. Especially wet interstadials, however, increased the quantity and size of wetlands which made for barriers that stopped fires, allowing chestnut, oak, and beech forests to occur as far south as what today is Florida. The dry cycles of climate of the LGM restricted the occurrence of these rich hardwood forests on the coastal plain to river sides and springs that didn’t completely dry up, following extended droughts and the dramatic drop in the water table. The terrain of the piedmont and mountains localized fires and created patchy environments of mixed forests and meadows quite different from those of the coastal plain. You are currently browsing the GeorgiaBeforePeople blog archives for November, 2010.